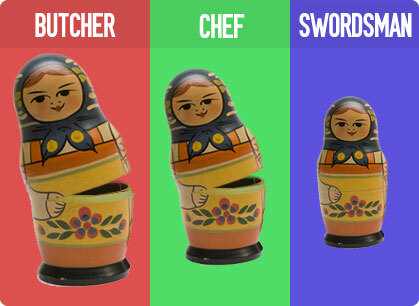 No one in my town was excited about The Butcher, The Chef, and the Swordsman. I’m basing this on the fact that I was the only one in the theater when I went to see it. The idea of a private screening is a shame though, as parts of the film are so delightfully psychedelic, that I would love to see how a casual audience would have reacted to it. Not exactly an anthology film, the slightly confusing story of The Butcher, The Chef, and the Swordsmen starts with a butcher named Chopper (Liu Xiaoye) who falls for Madam Mei (Kitty Zhang), a woman living in the House of a Thousand Flowers. Chopper attempt to get Mei is interrupted by the swordsman Big Beard (Senggerenqin) and is ejected from the brothel. Chopper meets a stranger who carries a cleaver who tells Chopper a story of about a famous restaurant known for it’s glorious eight-course meals. Only the dwarf chef (Mi Dan) knows how to prepare these meals and takes on an apprentice (Ando Masanobu) to teach his secrets. The apprentice however, has a secret vengeful agenda, that comes to place as the chef tells his apprentice the story about Fat Tang and how he came into possession of the special cleaver. Take that Inception! We don’t have dream within a dream but a story within a story within a story. The plot in the film is scattered with the most interesting one being the second cooking themed story involving the chef. I can’t recall the last time that food has looked so good on film. The singularly-named director Wureshan’s background in television commercials must have had some part in this, but I’d also give praise to the Polish DP Michal Tywonluk. I can’t exactly say who I would recommend this film too. If you are in it just for the action, the fight scenes are an editing mess with so much quick cutting it’s not easy to make out what’s exactly happening…and when you do it’s usually not as interesting. On the other hand, we have humorous scenes that are filmed exactly like a Street Fighter II battle complete with health bars. Wureshan says that he’s mostly influenced by American cinema, but the story in this film feels very Chinese while the energy and pacing feels more Hong Kong oriented. The acting in the film has it’s fair share of mugging and genuine talent, but it suits the story. Oh, and Kitty Zhang on the poster is a bit of a tease. Yes, her rose-printed head is the most prominent one on the poster, but she’s hardly in this. Not that it’s a problem as I throughly had a good time watching The Butcher, The Chef, and the Swordsmen but I can’t say I’m rushing out to see it again or grab it on DVD. If what I mentioned above peaks your interest than I encourage you to seek it out. I’m definitely up for whatever Wuershan will release next time. Maybe cut it down to one story next time? 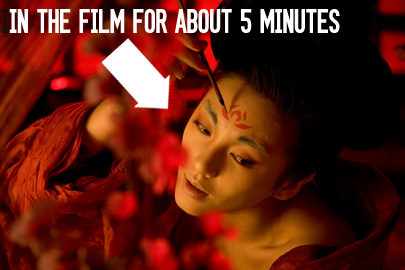 This entry was posted on Wednesday, March 30th, 2011 at 11:11 pm and is filed under ando masanobu, china, hong kong, kitty zhang, reviews, the butcher the chef and the swordsman. You can follow any responses to this entry through the RSS 2.0 feed. You can leave a response, or trackback from your own site. Sounds interesting, I’ll give it a go when I get a chance. It got some unwarranted horrendous reviews but I found it quite alright. It’s worth examining at least once. Your own personal screening must have been cool though, the nearest I’ve ever had to that was seeing Dobermann with just one other person in the cinema, the freak sat right behind me too. Ouch. I admit it’s pretty schizophrenic, but it wasn’t boring or too painful for me. What didn’t you like about it specifically? Hope you have better luck next time!